We’ve discussed a few options here at TNW for selling goods, both physical and digital. The problem with most of them is that, no matter how easy the setup might be, it’s still too involved when you just have a single item (or perhaps 3 or 4) that you’d like to sell. Gumroad is a solution to this problem, made by Sahil Lavingia who also developed Crate. Rather than creating an entire storefront, Gumroad lets you assign a link to a product. Clicking the link will take the user to a Gumroad page where your product is detailed, complete with the price. It’s a bit like the bouncer in front of the club, collective cover charge before letting anyone inside. The real beauty of Gumroad is that, since it’s nothing more than a link, you can include it in pretty much any communication. Rather than having users go through a website storefront, you can just send them a link (or heck, even tuck it into your email signature). Gumroad takes a percentage of each sale, based on a sliding scale of your total monthly transactions, plus $0.30 per transaction to cover merchant costs. When you share your link, users are taken to a page like the one shown below, which is generated from the information that you provided on setup. Gumroad should mask your file location, so that users can’t spread the link themselves. So far, you”ll need to host your own files. Though Lavingia does state in a thread on Hacker News that he’d like to work on an uploader, as well. 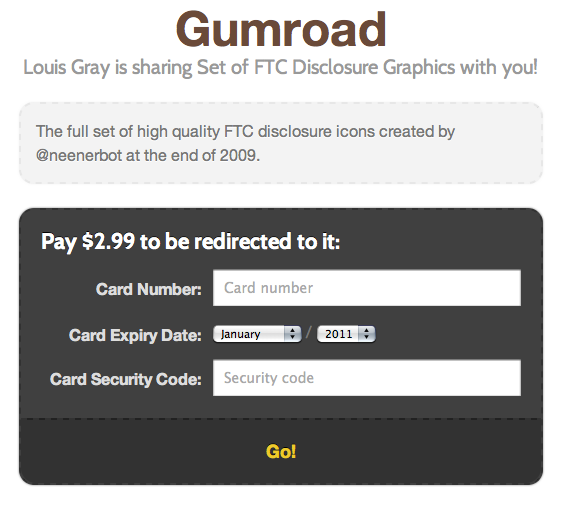 Whether you’re selling an e-book, your own music, snippits of code or (like Louis Gray) some hilarious FTC disclosure graphics, Gumroad makes it incredibly easy to do so. In fact, just writing this, I’m coming up with ideas and kicking myself for having not sold things in the past. Fortunately, moving forward, I won’t have to kick myself anymore. Read next: What will your next Tweet say? This site thinks it knows.